1. Change Custom Type 5 to Glossy. On the printers control panel press the Menu button - Choose Paper Menu - Choose Custom Types - Choose Custom Type 5 - Choose Glossy. Note: MP paper size/type must be set to Universal/Custom Type 5 for this to work. You may also set the paper size/type to Universal/Glossy. Choose Paper Menu - Paper Size/Type - MP Feeder Size/Type - Set to Universal - Glossy. 2. Cartridge. Replace any cartridges that are less than 40%. If all cartridiges are full replace each cartridge, starting with the black cartridge. 3. Increase Fuser Temperature. Follow this KB article to increase fuser temperature. 4. Humidity. This problem may occur more frequently in the winter months due to lower relative humidity which increases static. (See example below) Follow the guidelines in this KB article. 5. ITU. Replace the ITU. 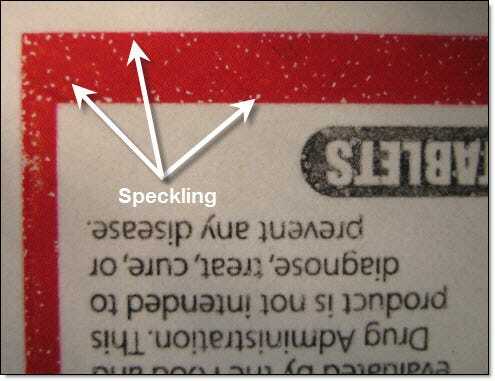 Below is an example of a speckled print. Note the difference between this and general print fading. This has small specks of no toner areas surrounded by completely solid toner areas. General fading caused by an empty toner cartridge or other issues would be a more consistent light toner transfer area throughout. 6. Material. Try a different material. Some of the topcoats that certain materials use are more susceptible to static than others. The label stock that Primera offers will not produce speckling on the outer edges as long the precautions specified above are taken. If the above suggestions do not eliminate the speckling on the outer edges of the printable area you can use dryer sheets in an attempt to remove excess static from the material prior to entering the printer. 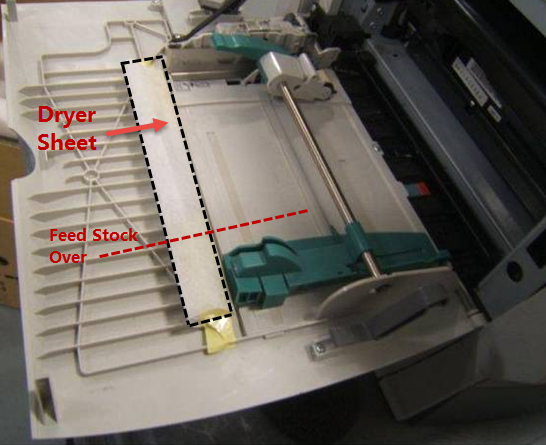 Fold up three to four dryer sheets (fabric softener sheets) and tape them across the MPfeeder door so that they touch the blank label stock before it enters the printer. Place the dryer sheets so they cover the entire width of the label path. 7. 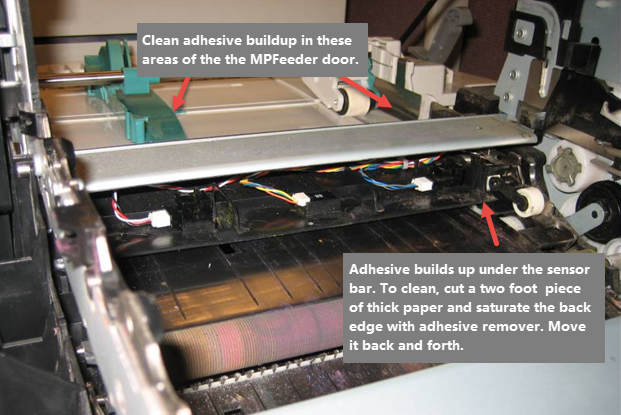 Clean adhesive build up from the MPfeeder door and inside the printer. Clean adhesive buildup from inside the printer. You can use Goo Gone, Goof Off or 3M Adhesive Remover.